Hidden histories housed within the iconic family home of the Earl of Devon could be unlocked in a new project led by researchers at the University of Plymouth. The University’s Cornerstone Heritage research group is working alongside the Historic Preservation programme at the University of Pennsylvania and the present Earl, Charles Courtenay, to reveal details of the remarkable transformation of Powderham Castle from a medieval stronghold into a Georgian country residence in the 18th Century. The two-year project is intended to enhance understanding about those who owned and worked on the Powderham estate, for the benefit of the current owners and the local community. 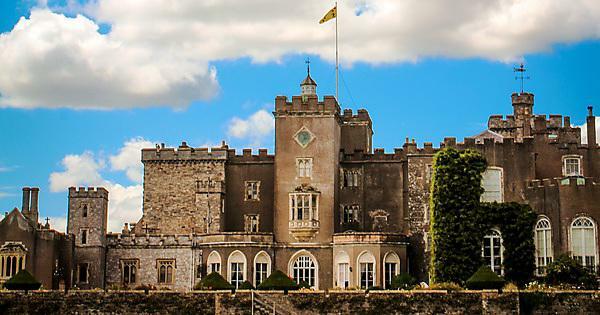 Powderham, which sits on the Exe estuary just outside Exeter, came to the Courtenay family in the dowry of Edward I’s granddaughter, and her son, Sir Philip Courtenay, began building the Castle in 1391. More than six centuries later, academics and students are beginning the task of digging through archival material while field work is undertaken to understand its unique development. Daniel Maudlin, Professor of Early Modern History, and James Daybell, Professor of Early Modern British History, are Directors of Cornerstone Heritage and leading the Powderham project. The many strands of the project include cataloguing the castle library, and producing a database of archived documents relating to the castle and Courtenay family (held in the castle and at local and national archives). It will also allow the current Earl to develop a series of new heritage interpretation content and platforms, including digital media. 'Live Projects' are at the heart of Cornerstone's activities. Live Projects engage with community groups and heritage organisations in the co-production of research-led heritage initiatives.